This page describes wiring that allows multiple Pro-150s and 4QD series controllers to be controlled from a single speed potentiometer. This is useful when double heading model locomotives. As the Pro-150 is a programmable controller, two Pro-150s that are set up identically will behave identically so that double heading them is simple and doesn’t need the complication of an extra connector. This scheme can also be used with, for instance, two 4QD-200 or 4QD-300 controllers [but set the gains and ramp controls on each controller the same]. The DNO controller comes with an expansion connector as standard that makes double heading straightforward. Our old VTX and Pro-120 models do include an [optional] expansion connector to simplify double heading, so you should use this with these controllers. In this both controllers are wired normally, but an extra connector is fitted to each so that pins B to F may be linked for double heading. Pin A is effectively battery +ve to feed ignition and reverse, so does not need to be linked.With this arrangement the controls may be plugged into either loco A or Loco B. Do not plug in two sets of controls, or the result will be confusing – though unlikely to do any damage if the controls are wired properly. 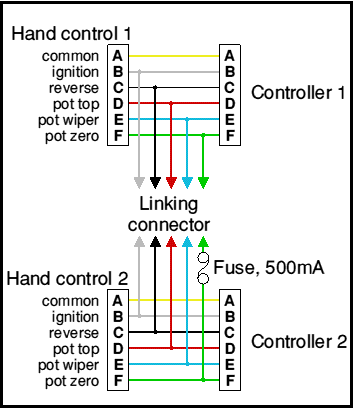 The controllers will detect a pot fault (Pt displayed) if the pot value is less than about 9.5K (half the normal value) with this wiring, as two controllers are detecting the same pot, so a 5K pot is recommended. Or solder a 22K resistor across the terminals of a standard 10K pot (to give an effective 6.8K pot). This is somewhat simpler, but in this, controller 2 is the master and controller 1 is always the slave. The controls can only be plugged into controller 2. 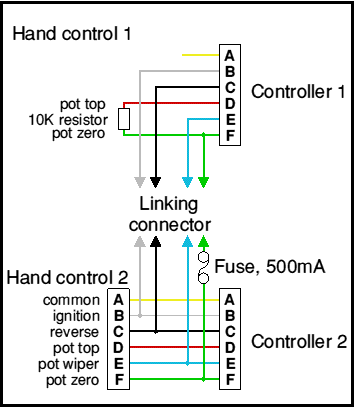 Note that this configuration needs a 10K resistor in place of the pot – and of course you won’t get a warning from this controller if a pot wire breaks. Note the fuse in the pot zero line. This is optional but if this is not fitted, or is too high a value, there is a risk of blowing the earth fuse track(s) on the controllers, depending on how the rest of the machine is wired, or what wiring faults occur. Consider the situation where the battery negative connections are both earthed to chassis – this may be intentional, or it may be through the bodies of such items as horns and lighting. Now consider that the locos are working – and there is a poor connection to one controller’s battery -ve wire. The controller’s negative current will now try and find its way to B- but it will flow through the pot zero link between the controllers and back through the connected chassis. Since the pot earth is a low current connection – something has to fuse, best make it a fuse fitted for that purpose! Its rating is not important but I suggest the smallest fuse you can easily get, which is likely to be somewhere around 500mA. See Earth fuse: why it blows for more on this. It is quite common to double-head with the locos nose to nose. In this case, one of the locos will need to go in reverse and the other in forward when double heading. The controllers will need to be switched to give symmetrical reversing. See the instruction manual.